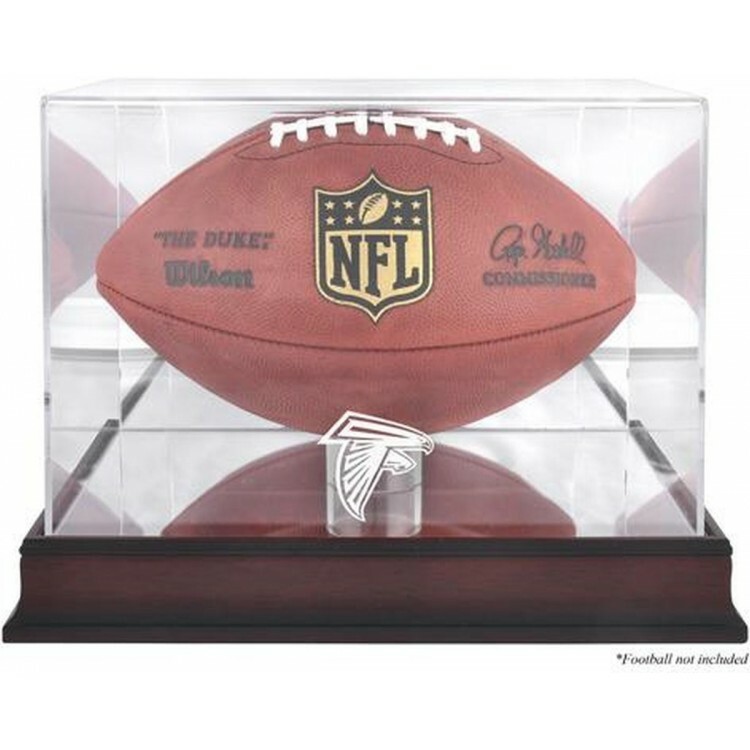 The Atlanta Falcons antique mahogany football logo display case features a 1/8'' thick clear acrylic removable lid with engraved team logo. It also comes with antique mahogany finished base that has a mirrored bottom and back. Perfect for a collectible football. Officially licensed by the National Football League. Inner dimensions: 12 1/4'' x 8 1/2'' x 8''. Outer dimensions: 13 1/4'' x 9 1/2'' x 10''. Memorabilia sold separately. This 8'' x 10'' photograph has been personally hand-signed by wide receiver Sammy Watkins. It is off.. In Centre and Harvards 1921 duel at Harvard, the final score was Centre, 6; Harvard, 0. Here's the o.. He shoots... he scores!! Display your favorite hockey puck in this collector's single puck case. You.. The Minnesota Vikings antique mahogany football logo display case features a 1/8'' thick clear acryl..
NEW! Our boardroom mini helmet display features a exclusive, custom designed base moulding profile f.. This baseball has been personally hand-signed by Hall of Fame pitcher Phil Niekro with the inscripti.. The Stanford Cardinal wall-mountable basketball display case is made of 1/8"-thick acrylic with a br..
Each of these collectibles comes designed with three photos, a team logo, and an actual piece of gam..